The thrilling action film Divergent is based in a futuristic setting somewhere near Chicago (now non-existent) used to be. The movie encompasses a similar concept to the The Hunger Games trilogy. What use to be the United States is now a society within a divided nation where all people are split into 5 different groups, called factions; Abnegation (self-sacrificers), Erudite (brainiacs), Dauntless (fighters), Amity (gentle souls), & Candor (the truth tellers). There are also what are called “The Factionless”, people who do not fit into any of the 5 groups. Beatris, or ‘Tris as she prefers to call herself, was born into Abnegation along with her parents and brother. However, at the chosen ceremony for all groups, each person from all factions at age 16 are required to chose a group to take part in based on test results that determine what their distinct qualities are. Although,’Tris’s test seems to be quite different from any others. Showing completely different results that do not categorize her into any 1 faction. These people, are called Divergents. Out of complete fear, ‘Tris decides to keep her test results to herself and chooses Dauntless as her new faction, separating herself from her family completely. Having to fight for a spot in the Dauntless categories against other, for fear of becoming “factionless”, Tris runs into a huge dilemma. She must keep the secret of her rare test results, for fear being discovered by the city leader, Jeanine, whom plans to get rid of all Divergents in her society. 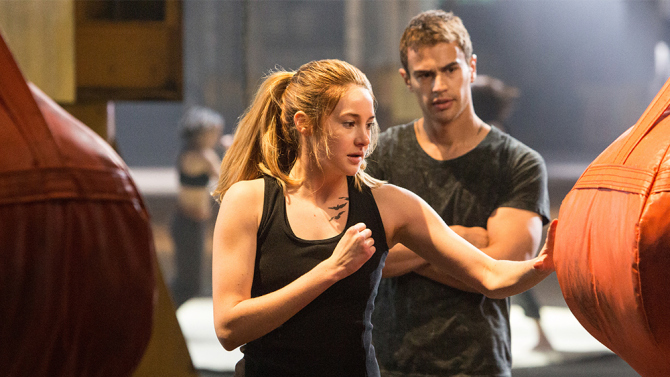 However, she has a little help from someone who discovers her in the Dauntless. She is now known as a danger to her society and can be considered by all leaders a threat to the whole system itself. And so she has to make a brave and sacrificing choice in order to protect not only herself but thousands of others within her city. Shailene Woodley keeps you hanging and entertained throughout the entire film. She may not have you rooting for her as much as Katniss’s character, Jennifer Lawrence, in the Hunger Games, but the naturalism of her performance makes her extremely appealing. The enticing sequel will definitely keeps us wanting more!